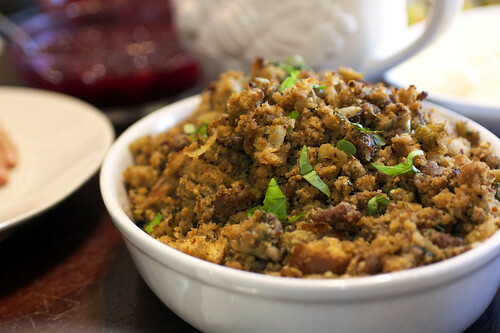 Yes, you read that title right, gluten-free stuffing. This year, after going two years without, my mom decided to bring Thanksgiving turkey back. Not because of me, mind you. It turns out my little nephew likes turkey now, and of course whatever my nephew wants, my mom gives. Which brings into question, does my mom love my nephew more than me?! Uh… Regardless, as is the case when we do have turkey, I’m in charge of the stuffing. I make the same spicy cornbread stuffing with sausage every time with a few variations here and there. For example, since my non-pork eating BF wasn’t joining us this year, I happily threw in a pound of spicy Italian pork sausages instead of the less tasty, less fatty turkey links. And no question, it made a big difference. However, what also made a huge difference was the gluten-free cornbread. Early this year, my brother came to the conclusion that he was sensitive to gluten. I’m still not quite convinced, I mean growing up in New York, my brother and I ate a sh*tload of pizza. As a child, I’ve even seen him eat a whole bag of Wonder Bread in one sitting. So when he had this revelation, I was dubious, but what can you do? You can’t control the way people want to live, or how their body may or may not react, so you let it be. 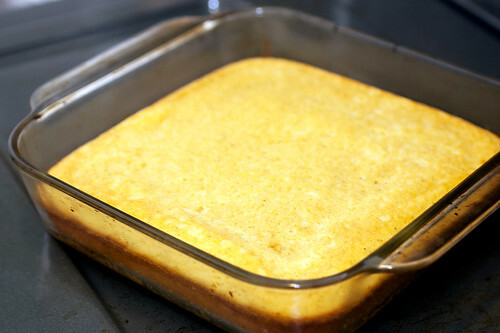 So this year, when making cornbread for my stuffing, I made 100% cornmeal cornbread, and let me tell you, it was awful. Crumbly and dry, it almost ruined Thanksgiving. It looked harmless enough when I took it out of the oven (pictured above), but one bite made me want to weep. Luckily, I was able to salvage it with a little bit of tinkering. For the dryness, more chicken broth and lots and lots of butter. And for the crumbly issue, two eggs to bind everything together. Will I be making the same cornbread next year? Probably not. Although it was still good, and everyone thought it was fine, the seasonings really saved it. Next year, I think I’ll try this recipe from Serious Eats, which I avoided this year because I didn’t have xanthan gum in the cupboard. (Does anybody on the regular?) Or if I’m lucky, perhaps next year my brother will no longer be afflicted with gluten sensitivity. We’ll see. In any case, till next Thanksgiving, gobble gobble! Delicious gluten-free cornbread recipes welcome in the comments!